The Japanese Chin is a relatively active dog with cat-like mannerisms and quite a favorite for many in Asia. The Chin is a high energy dog despite being known as a lap dog and because they are so active, they also have some special dietary needs. That means that finding the best dog food for Japanese Chins can be a little tough. But that is exactly where we come in! We've interviewed a number of registered breeders and trainers who helped us find some good dietary dog foods for your loyal friend. We hope to impart this knowledge and leave you with some good recommendations for you to consider. Japanese Chins are distinctively awesome little dogs who are particularly loyal to their owners. This lively, yet sensitive Japanese spaniel with its roots believed to be of Asian imperial courts makes a great companion dog. Some people believe it makes sounds that are perceived as songs. Charming, sensitive and may suffer with separation anxiety. May suffer from cataracts and heart murmurs. Good pet nutrition begins with knowing your dog breed, their diet requirements, associated health risks and knowing what's inside each product. In this section we provide everything you need to know about diet, health and feeding requirements before we skip to the reviews for each of the the top 3 Japanese chin dog food brands. 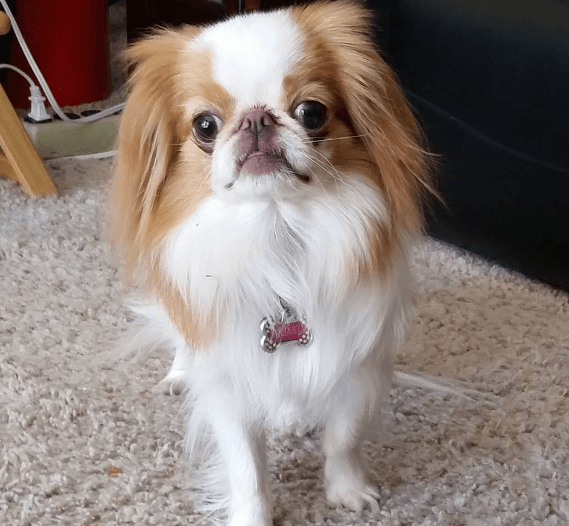 What Foods to Feed a Japanese Chin? Lean meats are a must for Japanese Chins. Look for chicken, bison, venison and fish on the ingredient label. These little guys are prone to hypoglycemia, so opt for good, complex carbohydrates. Avoid corn and opt instead for brown rice or sweet potatoes. To keep their mane as lovely as they are, they'll need good healthy fats. Salmon Oil, chicken fat, flaxseed etc are all good fat sources. Finally, a good dose of fruits and vegetables on the ingredient label means your furry pal gets all the vitamins, minerals and antioxidants it needs in order to thrive. The more, the merrier! Smaller breeds like the Chins have a longer lifespan than larger dogs, so be diligent about what you're feeding your little pal from the outset as you want them to live long and healthy lives. By depriving them of quality foods you're leaving their immune system vulnerable to all sorts of hosts. Good health, begins with good nutrition. Below are some of the top brands we recommend when it comes to feeding your Chin. Nutro: This brand offers a wide of variety of choice from dry, wet, seafood, vegetables to snack bites.Their blends provide an all-inclusive balanced diet. This brand offers other tailor made formulas for special needs e.g. weight management, high endurance and much more. Organix: A certified organic food brand.The food is prepared in a variety of ingredients ranging from organic millet, organic oats, dried egg products among others to provide a wholesome meal. A great brand for a diva dog such as the Chin. Blue Buffalo: Very popular premium dog food brand, that's more affordable but doesn't skimp on quality. Their foods are rich in omega 3, proteins, vitamins and minerals. Available in wet, dry and grain-free form. Holistic Select: Grain-free foods that are generally rich in omega 3, 6 amino acids. A great food for hypoallergenic dogs, that is dogs that are prone to sensitivities. Canidae: Grain-free and all favorite of ours. Human grade meats. High protein percentages. High calorie food. Pricey than most others, but nothing but the best quality. How Much Food to Feed Japanese Chins? Generally, toy breeds like the Japanese Chins, are quite fuel-efficient and burn through calories faster than larger breeds. Their small stomach is counteracted by their fast metabolism. So feed them small portions frequently! This can lead to owners over-feeding their Chins, forgetting they are still only small sized dogs. So how much food should you feed them? As a puppy, the Chin takes a little longer to start on solid foods as compared to other breeds. The weaning may start at 16 wks and weighing at least 4 pounds. A Japanese Chin puppy should fed at least 170 calories per day spread over three to four feeds to prevent stomach upsets. An adult Chin will need approximately 210 calories per day while an active Chin should go up 260 kcal/per day. Other factors to be considered include; age, size, and metabolism levels. Opt for quality meat-based protein when it comes to purchasing brand foods rather quantity or cost for better health for your dog. That's the key thing to take away with Japanese Chins - choose foods with a high protein to calorie ration. This goes for similar other small breeds - Chihuahuas, Maltese, Miniature Schnauzers, Pugs, Westies etc. Japanese Chins can be fussy feeders who can be prone to stomach upsets. So choose small size kibble which helps with chewing and improves digestion and in so doing preventing stomach upsets. Routine feeding from the breeder should be continued as its feeding pattern especially for puppies. The introduction of new food should be done gradually to avoid digestive problems. Always ensure bowls are clean and cool drinking water is regularly replaced.1/4 to 1/2 cup per day of dry or grain free foods are recommended with all the appropriate levels of key nutrients such as protein, vitamins and minerals. It is a hip joint disease which may affect the puppy by age 4-6 months. Its major sign is limping with femur connecting to pelvic bone disintegrating. This condition can be corrected via surgery. You as the owner can also help prevent joint disease by ensuring the foods you buy contain glucosamine and chondroitin. This is eye condition characterized by opacity of eye lens leading to unclear/cloudy vision. It is a common condition old age related and can be treated by surgery to remove the cataract. You can also help fight eye disease in your furry friend with nutrition. Look for foods that contain beta carotene such as carrots and cantalope. Just like many other small breed dogs, a Japanese Chin is no exception to this condition which is common to the small breed. Progressive Retina Atrophy may be diagnosed at an early stage before complete sight loss though its cure has not yet been found. To avoid this, look for a reputable breeder who can thoroughly screen and rule out the condition as it is hereditary. This is a heart condition which happens when polysaccharides deformity changes the shape of valves making them leak leading to heart failure. Regular exercise and change of diet may help suppress this condition. This may be an indicator of a bigger disease developing.The murmurs are as a result of blood flow disturbance within the heart chamber. The level of noise can be graded which could help to determine the condition. This is a genetic condition characterized by the compression of the spinal cord leading to paralysis. It is more common to young chins. Since this toy dog breed is prone to corn sensitivity and other common food allergens, feeding Japanese Chins with high quality dog food is essential in maintaining their health. The right dog food will prevent skin and allergy conditions that are so common in this breed. Blue Buffalo is a holistic dry dog food made in the USA, that was designed to meet the high energy requirements of small breed dogs. 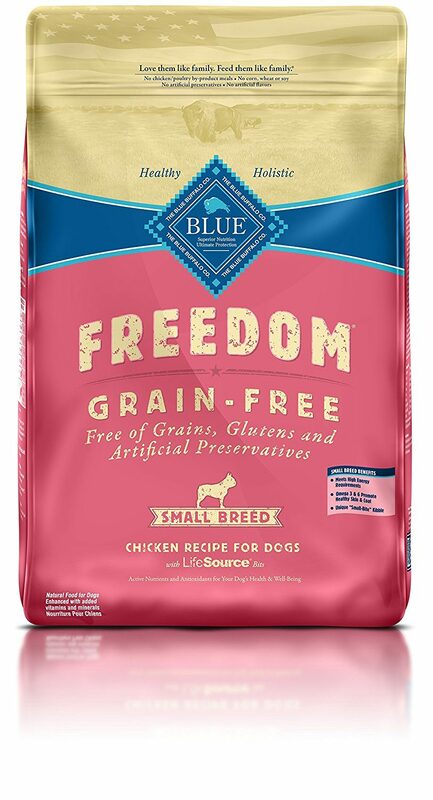 Blue Buffalo Freedom Grain Free is one of the best options for dogs like the Japanese Chin, since it doesn’t contain grains or glutens that lead to allergic reactions or sensitivity in some dogs. This formula is proudly made using only natural ingredients like potatoes, peas, carrots, sweet potatoes, cranberries, and blueberries. This food has everything a Japanese Chin needs to live a healthy active life, it even has small kibble that is designed to be easy to chew and helps remove tartar buildup. Best of all, there is no corn in this recipe, so owners don't have to worry about sensitivity of allergic reactions in their Japanese Chins. Blue Buffalo Freedom Grain Free comes highly recommended by other small dog owners. Many parents have seen a big difference in their furry friends after switching them to this brand, like softer coats and improved energy. Even the pickiest dogs enjoy Blue and their owners love how affordable the price is for such high quality. We particularly like that this food doesn't contain any artificial flavors, artificial preservatives, or chicken/poultry by-product. The Nutro Wholesome Essentials Small Breed Adult Farm-Raised Chicken, Brown Rice & Sweet Potato Recipe Dry Dog Food is another great choice for Japanese Chins. The main ingredient in this recipe is real chicken. The rest is loaded with other natural, non-GMO ingredients like whole brown rice, split peas, and whole grain oatmeal. Nutro Natural Choice is another corn-free brand with small sized kibble perfectly designed for the little jaws of small breed dogs and to help maintain healthy teeth. This blend uses a patented combination of Omega 6 fatty acids, zinc and B vitamins to provide your dog with glowing skin and a soft, healthy coat and antioxidants to support your pet’s immune system. The company guarantees that this dry dog food promotes healthy digestion for dogs with sensitive stomachs. 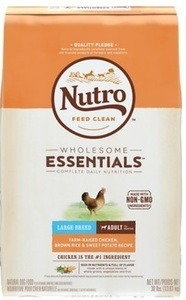 Nutro is a trusted pet food brand that has been around since 1926. Their pet food is made in the USA using traceable, responsibly sourced ingredients. Pet owners agree that this dog food is great for digestive issues and pets with coarse coats and dry skin. After switching their small dogs to Nutro, many pet owners see a dramatic improvement in their dog's overall health, and they love the price too! The small kibble that is easy for little dogs to chew and uses good ingredients that fill your dog up instead of fillers used in a lot of common dog food brands. 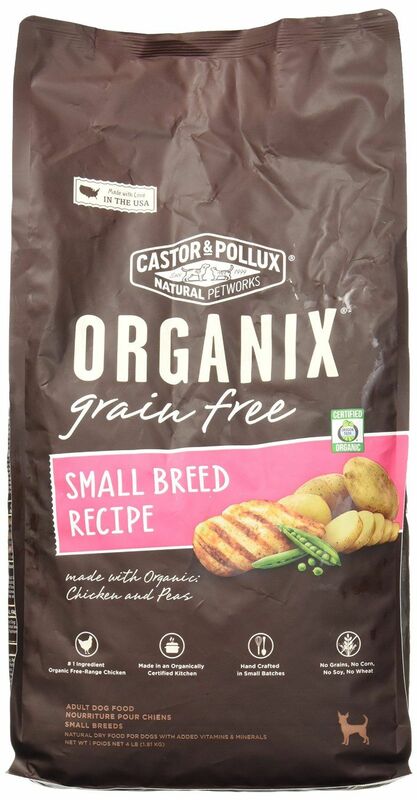 The Castor & Pullox Organix Small Breed is an organic grain-free dog food that is actually hand crafted in small batches. The company’s goal is to provide pet owners with food that can help maintain their dogs active lifestyle throughout its adult and senior years. This formula uses organic, free-range chicken as its main ingredient, complimented by other ingredients like fresh fruit and vegetable purees, peas, potatoes, and salmon. Organix small breed recipe doesn’t contain grains, corn, soy, or wheat, so it won’t trigger allergies or digestive issues in breeds like the Japanese Chin. This recipe uses organic flaxseed as its source of Omega 3 fatty acids to promote healthy skin and coat. Organix Small Breed provides your dog with a great source of fiber, antioxidants, vitamins, and minerals to ensure that they are getting the best care possible. Organix is USDA certified organic and made in the US. The company doesn't use any chemical pesticides or harmful preservatives that can negative affect a dog's health, so owners can feel good about giving it to their pets. Dog owners love this brand of organic small dog food because of its great reputation and healthy ingredients. Small dog owners have seen great improvements in their dog’s health after switching to this brand and picky dogs don’t seem to get tired of Organix Small Breed like they do with other dog food brands. Several pet owners have successfully used Organix to get their dog's weight problems under control. So, What's the Best Food for Your Japanese Chin? All three of the dog food brands mentioned above are great options for small breed dogs like the Japanese Chin. These dry kibble formulas are put together with healthy, natural ingredients to improve small dogs' overall health and each and one provide the nutrition your furry pet needs! My ‘Ralphy’ red and white Chin is spoiled rotten.. My daughter passed and left him to me. She only fed him off her own plate. I cannot get him to eat dry OR canned dog food. How do I cope…and change him. He’s approx 4 yrs old…was a rescue dog for her. Thanks. Hi Samm and thank you for your comment. I’m truly sorry to hear about your daughter’s passing away. Try setting his meal down for ten minutes. If he doesn’t eat it, pick it up and store it away. Wait until next scheduled meal time and try again. Repeat this process until he eats. Make sure you give him no cookies or treats in between meal times. It may be hard if he whines or barks but trust me, he will eat when he is hungry, a healthy dog won’t go starving by himself. Have you also tried other brands of kibble? If you’re very worried you can try getting a can of wet food or add dehydrated/lightly cooked/freeze-dried raw foods like Stella & Chewy and mixing a spoonful in with his regular kibble to entice him. It might take you a little time and some work but he will un-learn the old ways and hopefully begin to love his new food.